Hot tub filters are often overlooked until they are almost completely disintigrated and cracked. In the mean time, the spa plumbing, heater and other components were not getting the full benefit of clean water passing through the filter. In extreme cases, the water pressure drops at the heater and a FLO problem occurs. Also pump seals can wear, causing a leaky pump. Unnecessary maintenance issues like these can be prevented with routine filter maintenance. 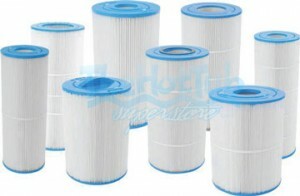 Regular washing between the pleats to clean the filter media will help extend the life of paper cartridge filters. At one point, usually every year to year and half, the filter should be replaced. Low priced filters are available online that are compatible with most any spa. Knowing a Pleatco or Unicel reference number will help assure the filter bought online will fit and work. Sometimes this number is stamped on the endcap of the filter, or the manufacturer can tell the customer what filter model it is. Otherwise, taking measurements of the filter is a sure way to find a suitable replacement online. How to measure a cartridge filter for replacement? Take the length of the filter and measure the width. Then measure the center hole diameter and make note of any obstructions such as solid end caps instead of ones with holes in them, bulging endcaps or strings and handles on one side. Some filters also have a threaded side that screws into the filter canister instead of most filters that just have a round hole going all the way through the filter center. With filter measurements in hand, compare the dimensions to ones found online and make note of the Unicel reference number for easier shopping next time. Find the best deals on replacement spa filters at SpaFilters.ca or see the page on Best places to find a discount hot tub filter online. Buying a Hot Tub Online – What if Something Breaks? When buying a hot tub online instead of from a retail store, one expects lower prices, but what happens if something goes wrong? It pays to buy directly from a hot tub manufacturer’s distributor rather than a no-name person selling someone else’s wares on the internet. A hot tub is a higher priced investment and even a discount hot tub should come with a guarantee and a source to turn to in case of problems. There is no better source than the factory trained technicians employed by the actual hot tub manufacturer. They are factory trained and know their product very well. The manufacturer will be able to ship out almost any part needed if something does go wrong with a trained technician to assist in troubleshooting and replacement. A reputable hot tub manufacturer with a distributor operating an online ecommerce store will help customers after the sale – often more than a sales person from a retail store or worse an online vendor that is not affiliated with the actual hot tub factory. Also beware of online sellers that hide costly upgrades until after you are within the purchasing process. Many times unscrupulous online sellers will hoodwink buyers into taking items that were already included on the spa to begin with and collecting extra money as costly options. It pays to compare “apples to apples” when shopping for a spa. Some things to consider are the quality of the shell material, the features including number of jets, horsepower and flow of pumps as well as soundness of the structure and cabinet. Getting a discount hot tub online can pay buyers in the form of huge discounts, so just make sure to deal with a factory owned ecommerce site for maximum after sales support.